Can you see yourself ……………as an Inspector, leading a team of officers as part of the second largest force in the country? The issues faced by today’s police service call for fresh ideas and new ways of working Join the police and change more than your career path. 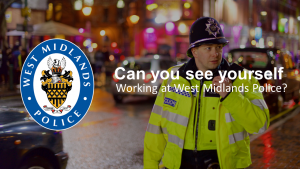 The national Direct Entry Inspector programme offers the training and support you need to make the transition from your current role as a leader in the public or private sector to an operational police leader and forge a new career in the police service with West Midlands Police. Direct Entry Inspector is for exceptional individuals with proven leadership and management skills who want a new, challenging and rewarding career. The two year programme has been designed to deliver robust and comprehensive training to ensure that, on completion, you will be a competent uniformed operational inspector able to make a positive impact on policing and your community. Although exciting, intense and varied, being a police officer is not a nine-to-five job. It involves unpredictable hours, often working in high-risk circumstances. You will be expected to manage critical incidents and to direct and support your team in dealing with situations that are often complex and time-critical. You will have to justify and account for your actions to ensure that you are working ethically, with integrity and to the standards the public expect. No previous experience of policing is necessary to join the Direct Entry Inspector programme. The two-year programme is a blend of classroom learning delivered by the College of Policing and our own operational training and development team. You will spend 80 per cent of your training working on operational rotations, learning first-hand what policing is all about. If you want to do something worthwhile and give something back to your community, then a career as a Direct Entry Inspector could be for you.